60 Years Later, What Can Activists Learn From The Montgomery Bus Boycott? Decades after Rosa Parks changed history, a new generation faces the challenge of remaking the civil rights movement for the next century. What can they learn from the past to build for the future? 60 Years Later, What Can Activists Learn From The Montgomery Bus Boycott? This undated photo shows Rosa Parks riding on the Montgomery Area Transit System bus. Parks refused to give up her seat on a Montgomery bus on Dec. 1, 1955, and ignited the boycott that led to the end of legal segregation in public transportation. 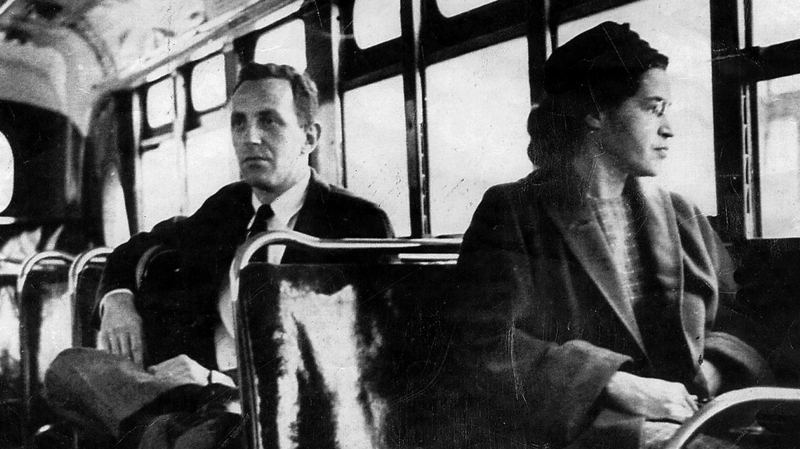 On Dec. 1, 1955, Rosa Parks refused to give up her seat on a Montgomery, Ala., bus to a white man. That act of protest and her arrest sparked one of the most famous civil rights actions in American history. Sixty years later, the anniversary of the historic boycott falls during a time when complex race and civil rights issues are in headlines. Today, Tuesday, Dec. 1, I'm heading to Dexter Avenue King Memorial Baptist Church in Montgomery to look back on the boycott, and speak with the new generation carrying the civil rights torch. In collaboration with member station WVAS in Montgomery, the live storytelling event also featured a Twitter chat to bring the conversation to a broad social audience. You can hear a recording of that conversation here, and see the Twitter conversation under the hashtag #busboycott60. Felicia Bell @RosaParksMuseum, director of the Rosa Parks Museum at Troy University in Montgomery. Monita Bell @MonitaB_TT, writer and associate editor for Teaching Tolerance, a project of the Southern Poverty Law Center, providing free educational resources to schools in the U.S. and Canada. Patrisse Cullors @osope, co-founder of Black Lives Matter, truth and reinvestment campaign director at the Ella Baker Center for Human Rights, and founder of Dignity and Power Now, an organization that supports incarcerated people and their families. Alejandro Guizar @AleAlejandro865, organizer with the Alabama Coalition for Immigrant Justice. Chris Kromm @chriskromm, executive director of the Institute for Southern Studies, a progressive organization focusing on issues affecting the south including civil rights, social issues, and economic development. Kayla Smith @itsoKAY_LAugh, Birmingham-Southern College student, African-American events chairperson for Cross Cultural, a campus group that promotes cultural diversity and understanding. Gwendolyn Boyd is the president of Alabama State University (ASU), her alma mater. Boyd returned to ASU after a career of leadership and public service that spanned more than three decades. Taylor Branch is a Pulitzer Prize-winning historian and author of several books following the life of Rev. Martin Luther King, Jr., including Parting the Waters: America in the King Years, 1954-63 and Pillar of Fire: America in the King Years, 1963-65. Robert Graetz is a civil rights activist and pastor in Montgomery who openly supported his congregants during the Montgomery Bus Boycott. Ebony Howard is the managing attorney for the Alabama office at the Southern Poverty Law Center. She specializes in youth-based civil rights litigation and reforming the education and juvenile justice systems.